There have been quite a few people interested in running OpenCPN forums (such as CruisersForum) and email lists. However a common criticism is that the performance is too slow. I don’t find the Raspberry Pi to be frustratingly slow, but it is definitely slower than a modern PC. 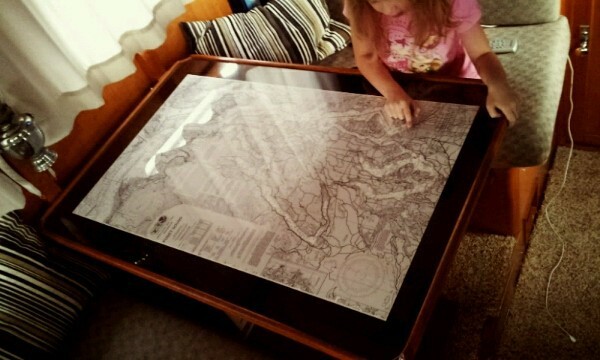 I compare it favorably to a low-end grayscale chartplotter/fishfinder currently on the market, but with a much larger full color screen. Everyone has a different tolerance for “slow” electronics, so to that end I thought it would be worthwhile to create a video showing exactly what kind of performance can be expected. I simply pointed my webcam at the screen to create the video below. There is no sound, and the camera had some difficulty with autofocus. It shows 5 minutes of OpenCPN running on my Raspberry Pi – from boot (power applied), through auto-launching OpenCPN, through GPS data acquisition. While waiting, I moved the chart around, zoomed in an out, and opened some other windows in the application. After letting the device sit for a few minutes, the utilization stabilized at around 10%. Hopefully, this can give everyone a good idea of what this low-powered and inexpensive device can do. Originally, we had intended to replace the countertops with a Corian type product, or granite/marble, or concrete, or laminate again. But every product we looked at had problems — too expensive, too heavy, too heavy and expensive, ugly, or not DIY friendly. So we looked into refinishing the existing ones. 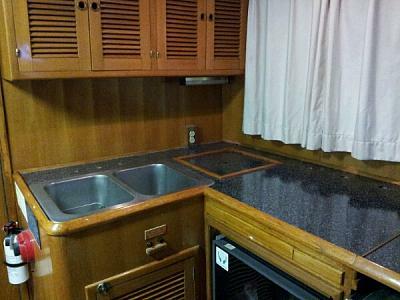 There was a post on trawlerforum.com that a member replied to, mentioning a new RustOleum product for refinishing laminate countertops. The local Home Depot had a “Charcoal” kit in stock for ~$150, which we picked up, along with the necessary brushes, rollers, tape, plastic, and other necessary accessories. That night, we removed all the hardware from the countertops and sanded the existing laminate down, per the instructions. About an hour later they were ready for the next step. 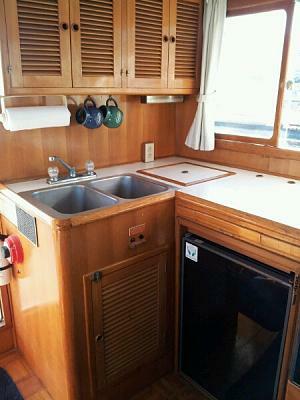 We taped every seam and edge, and laid plastic dropcloths around the stove, fridge, drawers, and surrounding areas. Then we laid think layer of the supplied base coat epoxy down, and covered it with the supplied chips. And then we went home. Total work on day 1: ~2 hours. manual… but we took our chances). Then we rolled-and-tipped the surface coat over the entire countertop. We left the boat for 5 hours or so to let the top coat set up. When we returned that evening it looked fantastic — and we cut and removed the tape, trim, and dropcloths, and went home. Total work on day 2: ~4 hours, spread out over ~9. The following Friday, we went down to the boat again to finish up. The top coat was entirely cured, but when it dried it shrank. Some of the flaws in our sanding and top-coat rolling showed through. Personally, I wish the top coat remained the same as it was when it was tacky, but not cured — but the product clearly passes the 2-foot quality check, and excels at the 5-foot-away check. 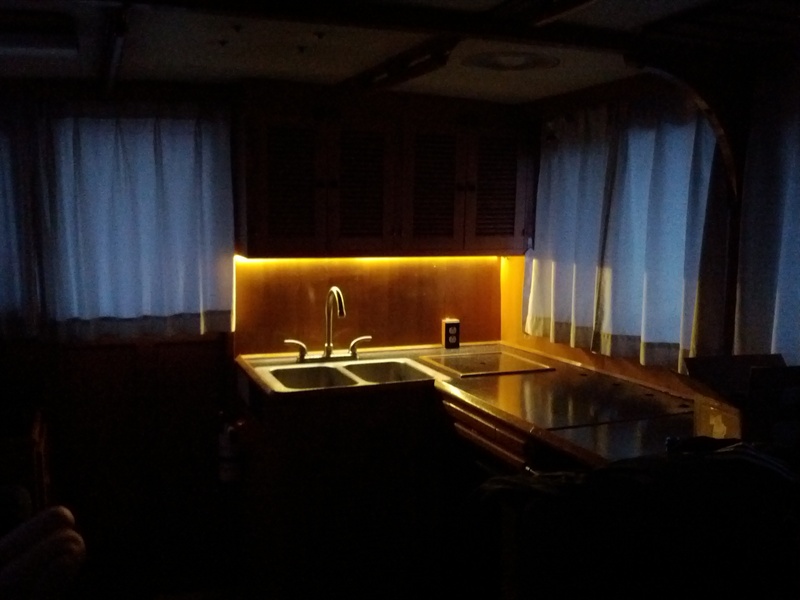 We caulked every seam with black silicone, installed a new faucet, and put in some LED lighting. Total work on day 3: ~2 hours. Finished product: For less than $200, and a weekend’s work, we have “new” countertops. They look as good as any laminate we saw, and it was much much easier to install. All in all, a good buy, and a good product. 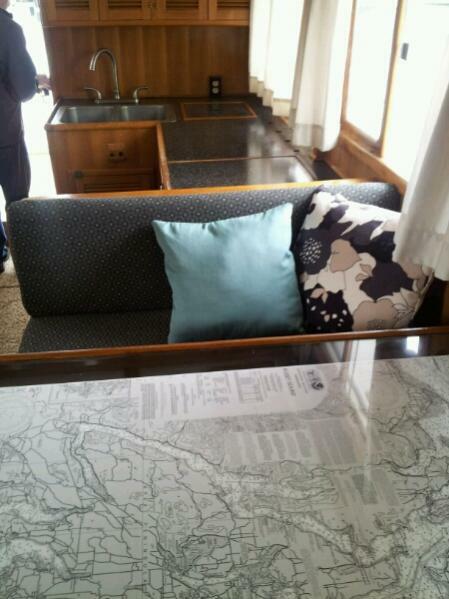 Just a few cell-phone pictures of our in-process project, reupholstering all the cushions in the cabin. We found that the foam is in good enough shape that we didn’t replace it this time, but instead just covered it in a couple layers of batting. We did put vinyl on the bottom of both cushions to prevent moisture and slipping. So far we have just spent a couple nights, and got the dinette cushions completed. We took them down to see how they look, and make sure we are on the right track. 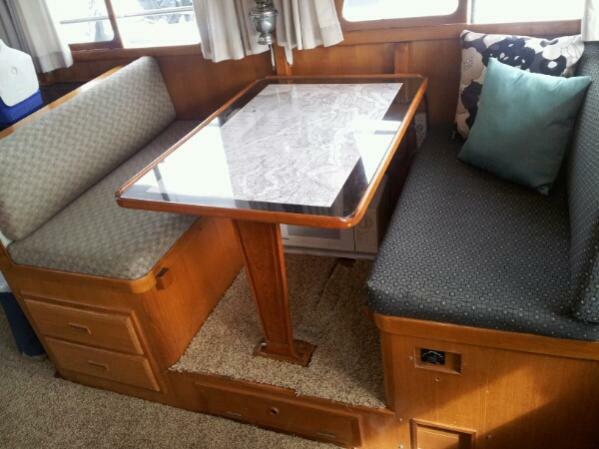 The dinette table is just a cheap 1/8″ sheet of acrylic that was about $50 for the sheet from a hardware store. I cut it to size using a $4 cutter, and the corners were added using a hand-planer. Only took about 15 minutes to complete. The original laminate top was sanded down, and a coat of black spray paint for plastic was applied. The chart was downloaded from the NOAA historical charts website, converted to grayscale, and printed at 36×24. It’s one of my favorite features in the cabin now. I highly recommend it! A few months back, my wife and I had been listening to Pandora at home, and I had as well on my PC at work. We then found out that she can stream Pandora via Bluetooth through her car stereo, and she was hooked. So we had the idea to replace the old radio (cassette player!!!) 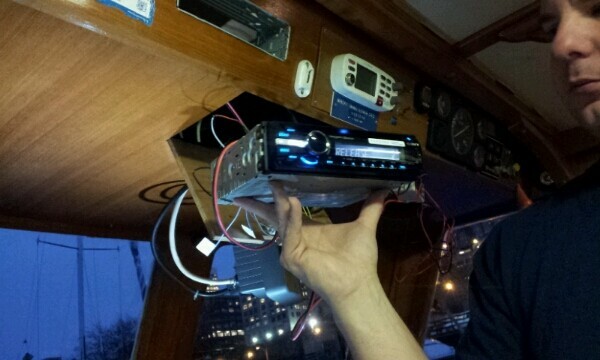 in our boat with a new stereo that had this same Bluetooth functionality. One Friday we went to Best Buy, and told the dumbass in a blue shirt that we wanted a cheap Bluetooth radio. He gave us one, but I looked and saw on the box that it was described as “Bluetooth Capable”. I asked him what that meant, and he said you need the adapter ($79) to receive the Bluetooth feed. No thanks. Next radio on the list: $109 JVC. Says “Bluetooth Enabled” on the box, and even has a PANDORA sticker on the faceplate. I buy it, go to the boat, install it (cutting holes, soldering connections, the whole bit). The whole process took about 2 hours. Before finishing the installation, I plug it in to test it, and the radio works. I finish installing it, turn it on: phone connects to Bluetooth first try! Open up the Pandora app, and … music only plays through the phone. Not the stereo. Open up the laptop and start searching the web for solutions. On Amazon, find the line that the Pandora app only works through USB, not via Bluetooth. No Thanks. Open back up the cabinet, snip, snip, snip…. rebox. The next day we are back to Best Buy. Returning the JVC, I tell the next dumbass in a blue shirt that we don’t care about any features of the radio EXCEPT for streaming music via Bluetooth and specifically Pandora. Next up, a Kenwood model for $179. I ask what the difference between the logo on the one I bought vs. the logo on the new one is, and he said the difference is “Bluetooth Capable” vs. “Bluetooth Enabled”. I say nothing about noticing the difference yesterday myself, and decide to just give him $70 more dollars instead. Back down to the boat, re-open the cabinet, solder all the wires, plug in the harness, hook up speakers (left speaker doesn’t work all of a sudden, I’ll deal with that later), put it in the bracket, turn it on… perfect so far. Connect via Bluetooth: works on the first try. Open Pandora app: nada. Ask the interwebs once again. Find the following on the Kenwood website: “Note: This particular model does not support Bluetooth streaming. To stream media, connect the supplied auxiliary cable”. No. I want to wirelessly stream Pandora, thanks. Re-open cabinet, snip, snip, snip; forget reboxing; throw it as is into the bag. Next day, back to Best Buy. 3rd dumbass in a blue shirt. This time I actually CALL him the third dumbass in a blue shirt I’ve talked to. I say… slowly… enunciating each word….. I. WANT. TO. WIRELESSLY. STREAM. PANDORA. FIND. ME. A. STEREO. THAT. DOES. THIS. He disappears for 15 minutes. He comes back with a Sony model. BIG STICKER ON THE BOX: Wirelessly stream your digital media via Bluetooth. BIG STICKER ON THE FACEPLATE: Built in PANDORA App. All for $120. Dumbass in the blue shirt the day before cost me $50 and didn’t give me what I wanted, not to mention my time, effort and $4/gallon gas. I Buy it and EVEN GET BACK $50! Back down to the boat. I re-run speaker cable (that I remembered to bring from home) to both the left and right speaker. Don’t solder, just twist tie the wires together. Turn it on and the radio works. Connect the phone via Bluetooth, and that works. I open the Pandora App and play. It CONNECTS! But no sound. After a few minutes searching the manual, I find this note: “Hit pause when first starting the media stream (#6 station preset button)”. I push the button and MUSIC STREAMS THROUGH BOTH SPEAKERS! YAY! Then: solder, hook up, faceplate, etc, etc. Turn it on, and…. I investigate with my meter, and discover that a fuse simply blew. Old radio had a 7 amp fuse. Current radio needs a 10amp. Run to the marina store to get a replacement fuse… ALL IS GOOD! FINALLY! 3 days. Probably 12 hours of driving, buying, and install time. $109… er $179… er $120. But on a Sunday afternoon we had it set up and streamed music all music all night, with no problems. Stereo remote even skips, pauses, and adjusts volume on the Pandora app. It’s a really nice feature. If anyone is looking for the same feature, and to save the aggravation of talking to the dumbasses in the blue shirts, make sure your new radio supports A2DP. That is the specific Bluetooth profile that allows streaming media wirelessly.